This book chronicles the air battles of the middle World War II period, in which the Allies held Axis expansion in the European, African, and Atlantic theaters in check. From the battle of Stalingrad, to El Alamein, to the combined bomber offensive over Germany, airpower played a critical role in the Second World War. During the middle-war period the Allies used airpower to hold Axis expansion in check, equipping themselves for the first time with large numbers of modern fighters, bombers, and attack aircraft. These aircraft, along with new tactics and strategies, would play an important role in turning the tide of war. 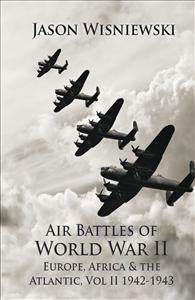 This book provides a blow by blow account of the fighting in the Euro-Atlantic theater during the 1942-43 period. Pre- and post-campaign analyses are also provided.